Yesterday’s price action gave us an interesting setup with the S&P 500 ($SPX). As the chart below shows, we broke the trend line (again) from the November ’12 low. We had a false break in June that was corrected and led to new highs, will the same thing happen this time? Yesterday’s price action took the DJIA to its 100-day MA, which was a topic of SentimenTrader’s note this morning. The 100-day moving average acted as support during the June swoon before we took off to new highs in the major indices. I’ll be watching this moving average if we continue to experience weakness and the current support at the 50-day MA is unable to hold up. What’s still concerning is the consolidation of breadth. Most notably the percentage of stocks above their 200-day moving averages. I tweeted out the chart of this negative divergence earlier this month and it hasn’t improved since then. Think of breadth as oxygen to humans (and other mammals). We can survive for a short period of time without oxygen, but eventually we either need to get more air in our lungs or we die. There are numerous of examples of diminishing breadth as the equity market marches higher. Most recently we saw breadth narrow in early 2013 while the S&P 500 put up double-digit gains. However, participation has eventually re-entered the market to give it the boost needed to hit those new highs. Before nearly ever major correction we have experienced a narrowing of market breadth as the underlying issues lead to the fall of the major averages. The key point is, breadth didn’t slide earlier this year to the low levels we presently find. If bulls are to take this thing higher, we MUST see greater participation. At the end of the day we are still in an up trend with equities putting in higher highs and higher lows. For many traders that’s all they need to know. 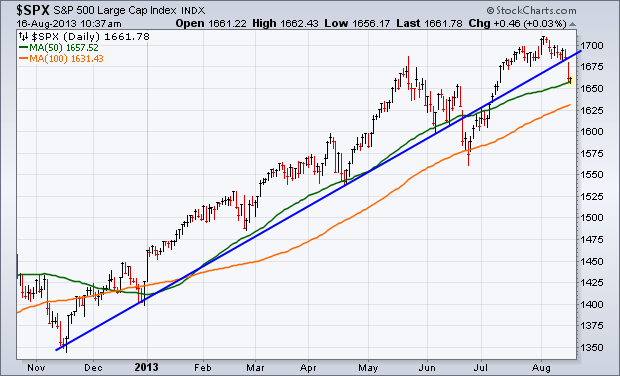 But going forward I’ll be watching for support at the 100-day MA followed by the June low. If price ticks higher, we need to see breadth widen – whether it’s in the number of stocks above their 200-MA or advancing minus declining issues…however you chose to measure it – it needs to strengthen to continue staying bullish. This entry was posted in Commentary and tagged SPX). by Andrew Thrasher, CMT. Bookmark the permalink.